Notice: As of 02/2018, pages with less than 2,000 likes cannot install static tabs or campaign tabs. Users can continue to run all apps on a landing page or embedded on a web page. Website ReSizer, available to businesses and organizations of all sizes,brings in perfectly sized web pages to a Facebook tab or within a web page. It’s a solution for every companythat spent money investing in their website and thenwished they had the same functionality on in other locations. Simply add the website to your fan page tab, resize to your liking so it all fits nicely, and publish! Create Viral Photo Contests where visitors or Admins can upload their photo entry for your fans to vote on! Canvais a powerful online design tool enabling non-designers and professional designers to easily create customized images to use. TabSite has partnered with Canva as a early beta release partner to integrate the Canva Designer into the manager area of each App. What is the Canva Button? In short, Canva access and power within web-tools like TabSite! Easily create and deploy a lead capture landing page! Have visitors and fans enter for a chance to win! Keep them coming back with weekly or regular giveaways. Sweepstakes allow visitors to submit entries during a promotional time period. Each entry is e-mailed to you. From the entries you can pick a winner. Users can view/capture/export data and use the system tools to randomly select up to 5 winners. ....boost the reach of the promotion by having entrants incentivized to gain more entries by sharing it with Facebook friends! SWEEPSTAKES PLUS IS A POWERFUL PROMOTION APP THAT IS VIRAL BY NATURE. Setup a sweepstakes with form for fans to enter to win a prize. The winner is chosen randomly but entrants that share via Tweeting get more entries! All of this is tracked for you. The Mailchimp integration is within any app that offers a form (except Drag N Build which is a unique app). Simply go to the Integrations section (in left menu). 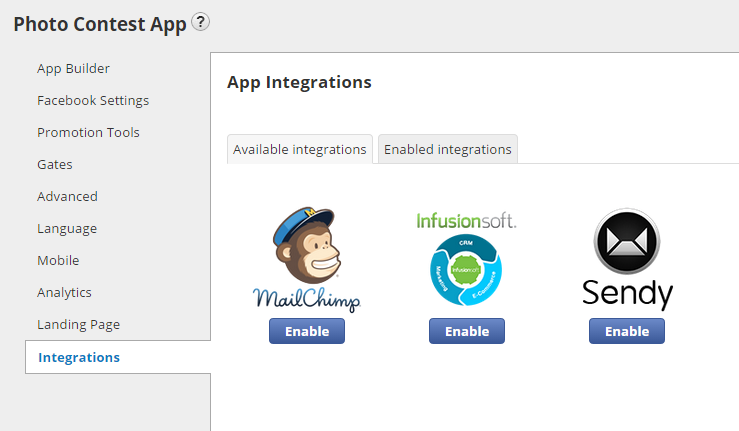 The Infusionsoft integration is within any app that offers a form (except Drag N Build which is a unique app). Then select "Enable" on the Infusionsoft option. This opens a input box. Click the "Get API key" button in step 1. An Infusionsoft window will open for you to login to Infusionsoft. Upon login it generates your API Key for Step 2. 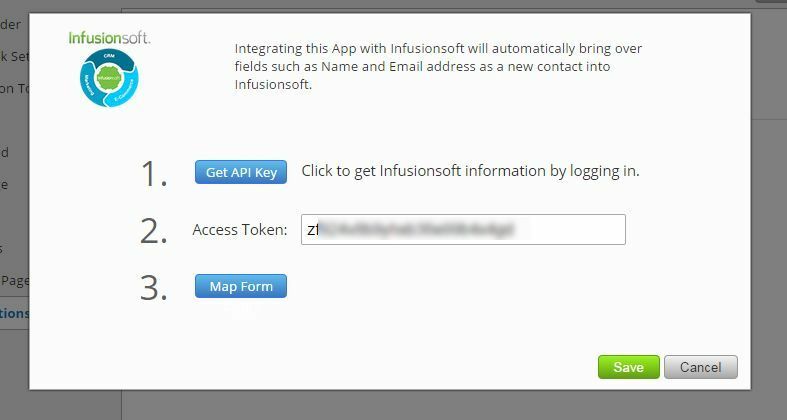 Then simply click the "Map Form" button in step 3 to map your form fields to the Infusionsoft fields. Coming soon is ability to pull in your Tags (pre-existing) and tag entries for easier marketing automation. Use this feature to complete your lead capture and nurture scenario!